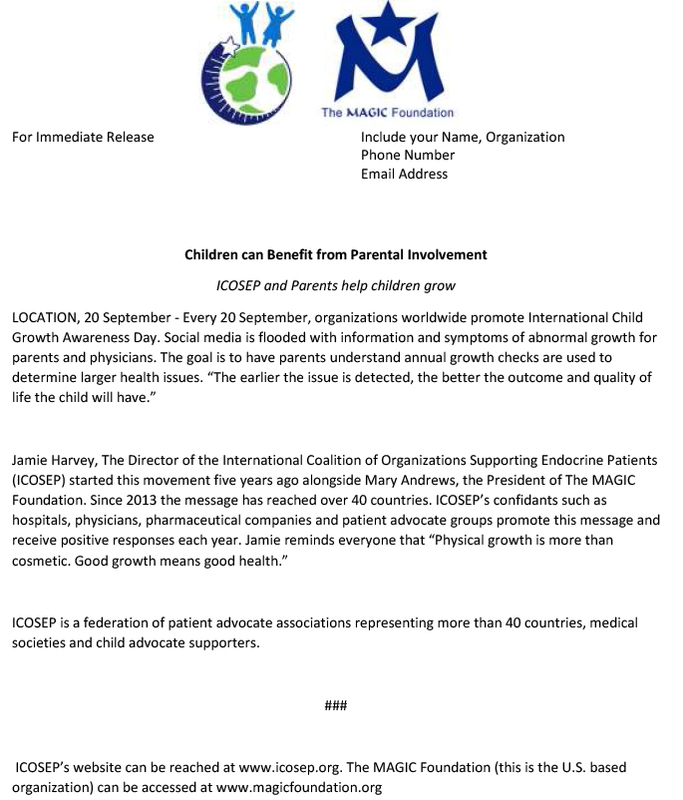 Below is a sample Press Release for organizations promoting International Children’s Growth Awareness Day. First, schedule a meeting or call your local news station or radio station. Discuss your purpose and ask them to share the information. Second, this press release should be given to the media two weeks before 20 September. This can eliminate any issues they have with sharing the message. If you have questions regarding the process of a press release, please contact jamie@icosep.org. ICOSEP strives to promote public education. ICOSEP can help parents learn the need of having an annual growth check. Each year, on 20 September organizations around the world share our message: Good Growth=Good Health. The goal of Growth Awareness Day is to change the health outcome of children with unidentified growth disorders. 1. You will not be given contact details. We will contact the families and ask them to contact you. 2. We do not work with any type of media which involves disguises, sensationalism or other tactics which would be harmful to “our” children. If you are interested in our Educational Outreach efforts in a fair and protective way, we will work tirelessly and diligently with you. The MAGIC Foundation is the U.S. based organization.